Here’s the Bartow County GA Real Estate Sales Report for October 2018. This report gives detailed real estate market data for Bartow County in October 2018. We’ve reached that time of year where it’s normal for real estate activity to slow down significantly in preparation for the holiday season, however this month’s real estate market data for Bartow County is telling a different story. 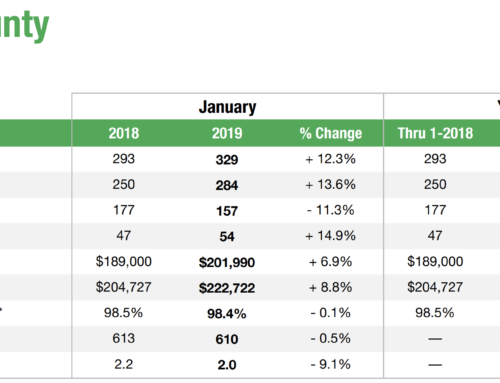 Compared to last year’s data, real estate activity has actually increased in Bartow County: closed sales are up 9.7%, pending sales are up 10.7%, and new listings are up 7.9%. There was 23.4% more new listings on the market this month than there was in October 2017! With so many new listings being added to the market, you may think Bartow County real estate inventory is creeping upward, but that’s not the case, either. There is 5.4% less inventory on the market than there was this time last year, and the month’s supply of inventory is down 16.7%. The good news for Bartow County homeowners is that houses are selling 17% faster and for at least 8% more; the average sales price for October 2018 was $215,461 and the median sales price was $193,000, which is respectively 8% and 14% higher than last year’s figures. If you’re thinking of selling a home in Bartow County, it’s a great time for it! There’s even more interesting details in the full report. To view the full October 2018 real estate sales report for Bartow County, GA, just click here.